A short introduction to the The Marriage Course. Introduces potential guests to The Marriage Course. This booklet lets people know what the course involves and contains testimonials from couples who have been on the course. Register your course at courses.relationshipcentral.org. 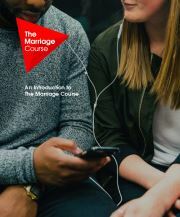 Following press coverage on The Marriage Course, we often note 'Find a Course' searches increase by as much as 460%- your course may be the one a couple needs! Marriage Course Introductory Guide by Nicky & Sila Lee is published by Alpha and is our 14577th best seller. The ISBN for Marriage Course Introductory Guide is 9781909309784. Be the first to review Marriage Course Introductory Guide! Got a question? No problem! Just click here to ask us about Marriage Course Introductory Guide.